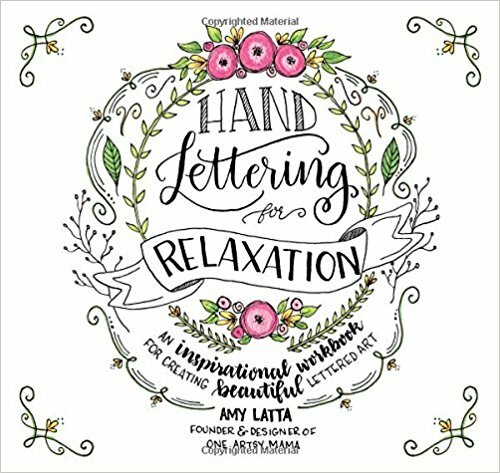 Last month I recommended a new book I had picked up called "Hand Lettering For Relaxation" by Amy Latta. I am about 6-7 lessos into this workbook and still enjoying it very much. Today, I picked up another book - one that I have had checked out from the library. 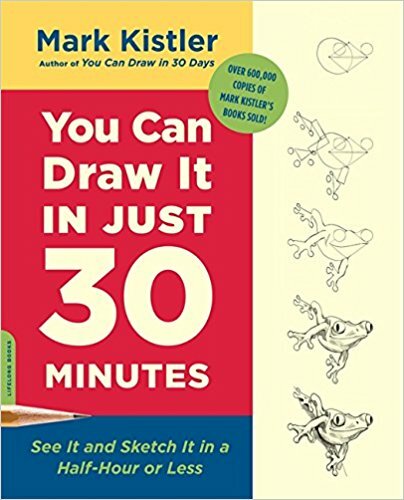 It is called "You Can Draw It In Just 30 Minutes : See It and Sketch It in a Half-Hour Or Less" by Mark Kistler. The techniques he teaches are simple, easy to follow, and very effective. Are they great works of art? No! 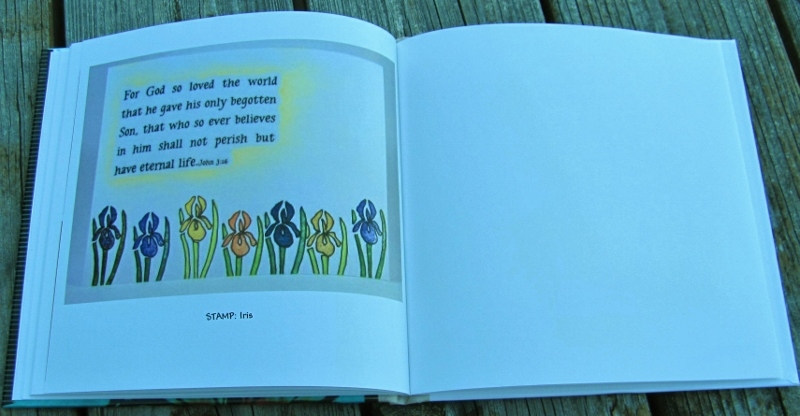 But my intent is to be able to learn to di sketches from photos (or life) for my Bible Journaling, instead of often relying on someone else's sketch. I tried it out on the Bible page that will be posted on Friday and I am very pleased with the results. Whoosh! 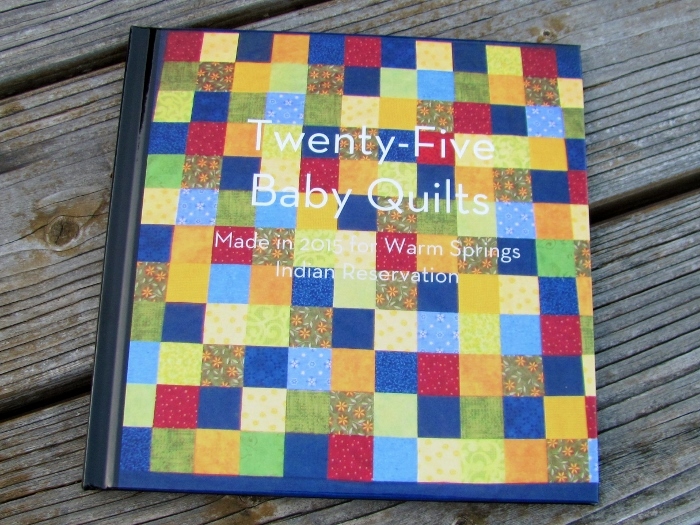 Shutterfly is fast on delivery of the books I have designed. I ordered this one late on June 29 and received it in the mail on July 2. 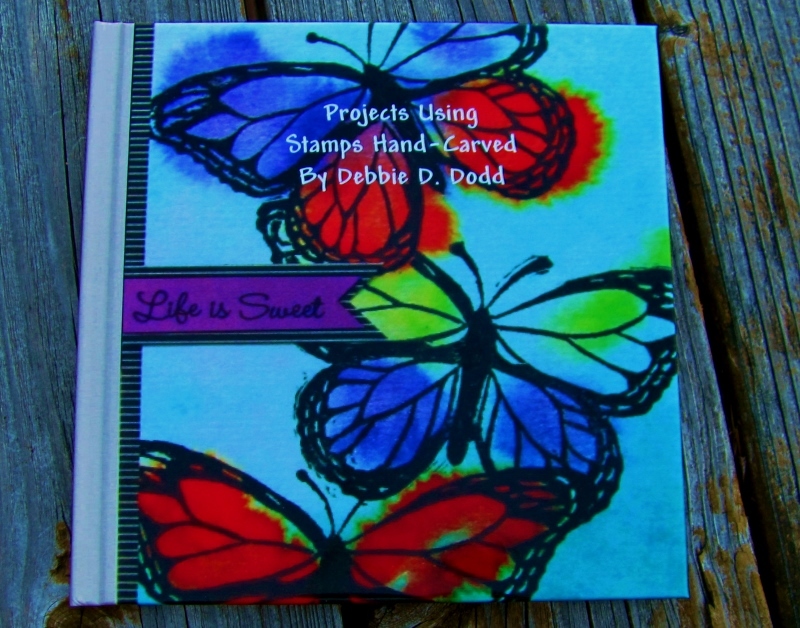 The subject I chose for my book this time was the use of my hand-carved stamps. I have been carving for years - sometimes with a craft knife and sometimes with Speedball carving tools, sometimes using erasers (both pink and white) and sometimes using pink or white carving medium. Personally my preference is for the carving tools on pink carving medium. I think it yields a much better result. In any case, I have quite a collection of hand-carved stamps and use them a fair bit. 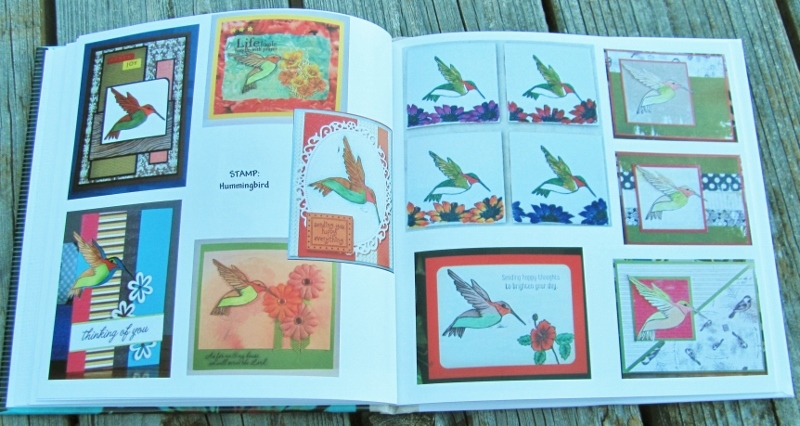 Some are more popular than others: Hummingbird, Roses and Butterfly. 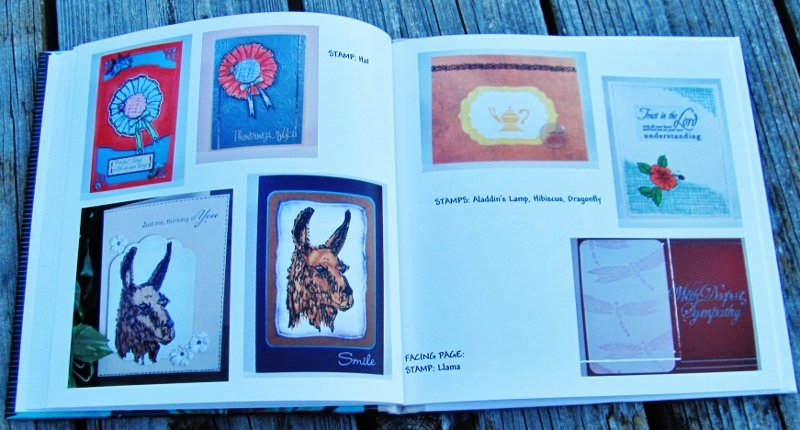 For the book, I collected photos of projects and grouped them by the stamps I used along with simple labeling. 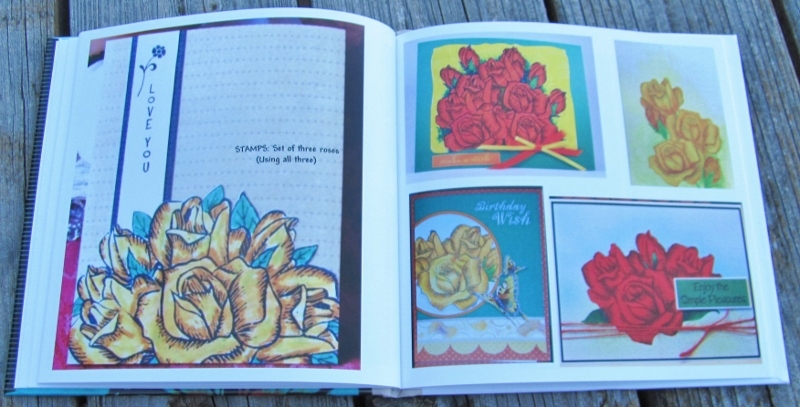 This next spread features single stamps around the edges and one card that combines them all in the center. On the left is the Lighthouse. At the top-right are two different Fish and the lower-right shows the Tulip Cluster. The center card uses all except the Tropical Fish. 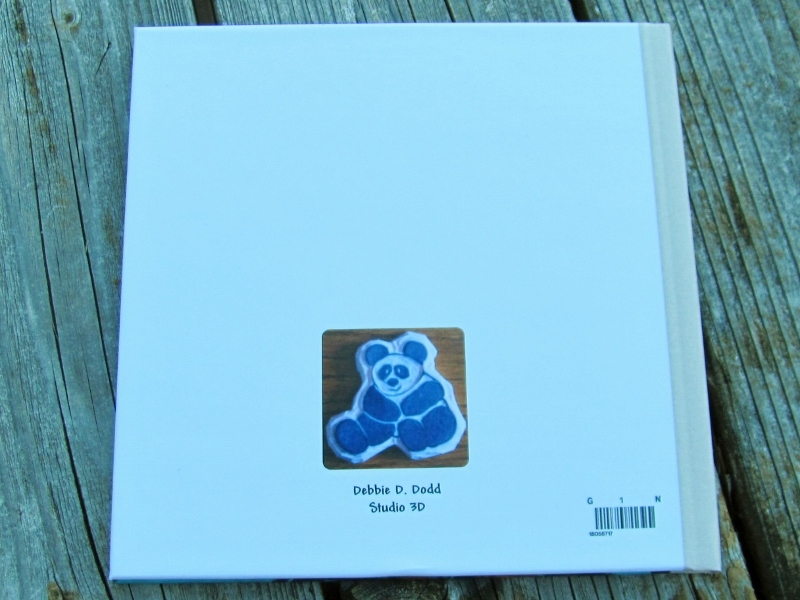 On the back cover I included the actual Panda stamp I carved for my grandson but never used on a project. My other grandson has a Train Engine I carved but never stamped. 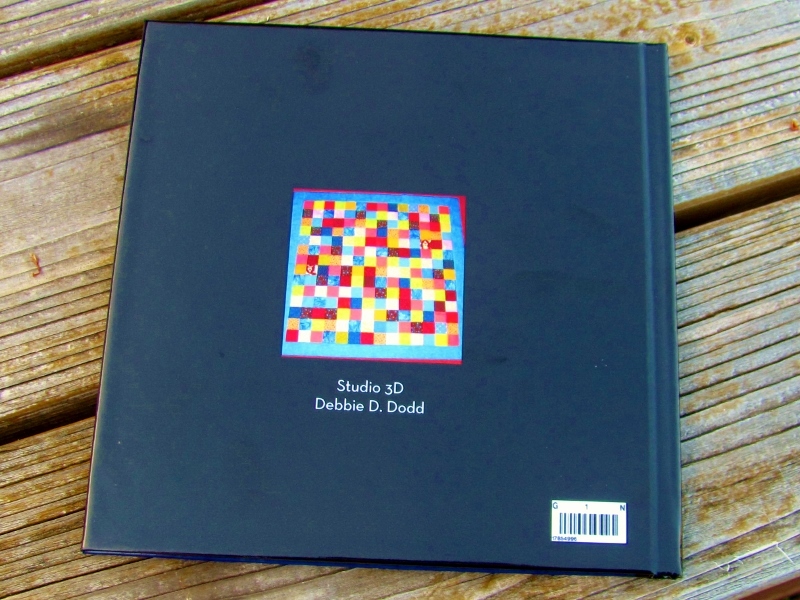 The back cover also includes Author and Studio information. Another fun project is 'in the books'. 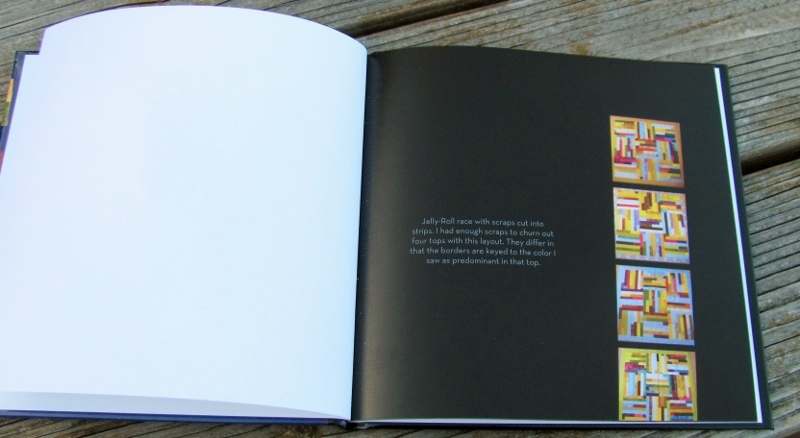 Remember how I said that if I ever got a coupon to make another free book with Shutterfly I would sure do it? Well, I got one of those coupons and finally decided what to make a book about. 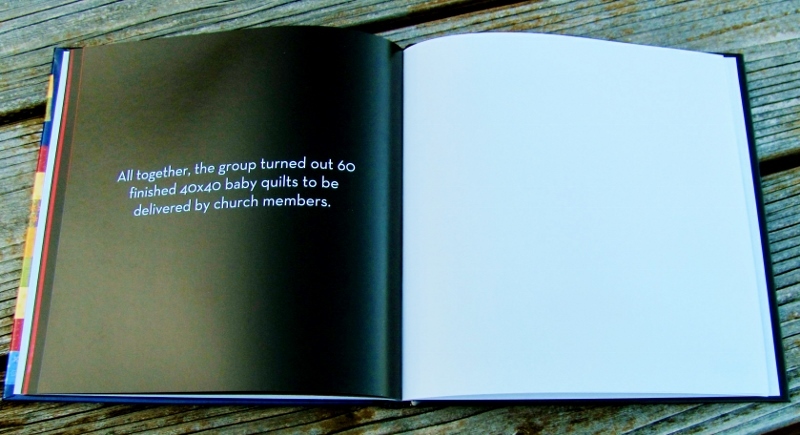 I chose to document the 25 baby quilts I made for a donation project at church, where our quilt group meets. 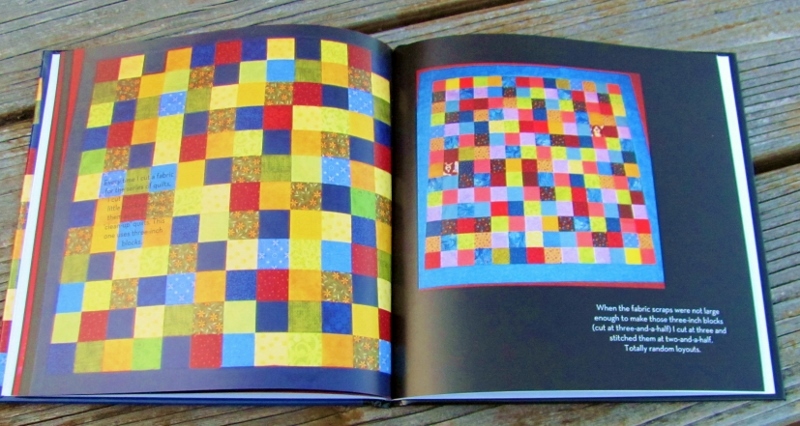 For the cover I used an image of a quilt with an over-all random arrangement of scrappy squares. A title in white print showed up best. 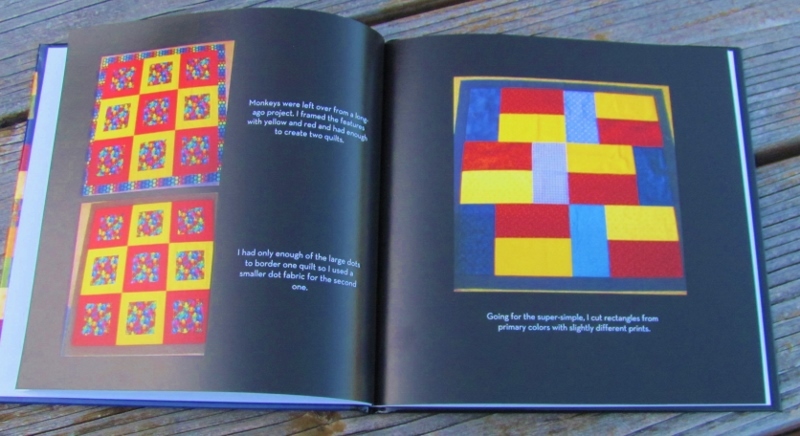 This is an 8x8 hardbound book with black pages to show contrast with the colorful quilts. 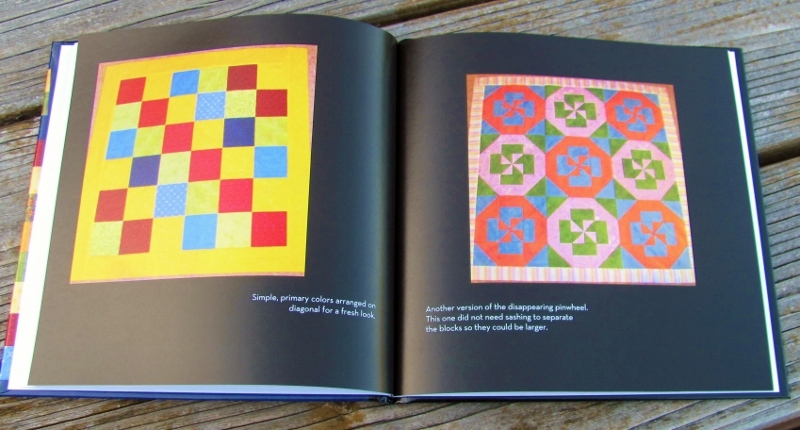 The first page groups together 4 strip-pieced quilts with the same scraps and layouts. 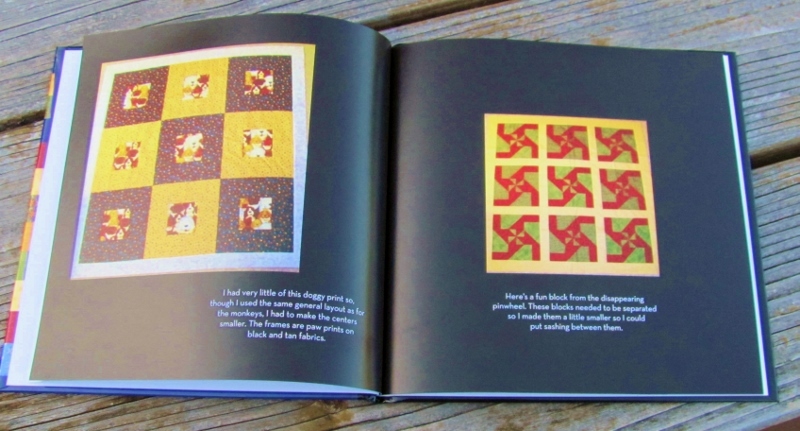 Since the book only has 20 pages and I had 25 quilts I made layouts that combined similar projects. Since I've showed these all before on multiple platforms I'll just show the layouts instead of commenting on each one. I kept changing the layout of the pages to keep the look fresh. 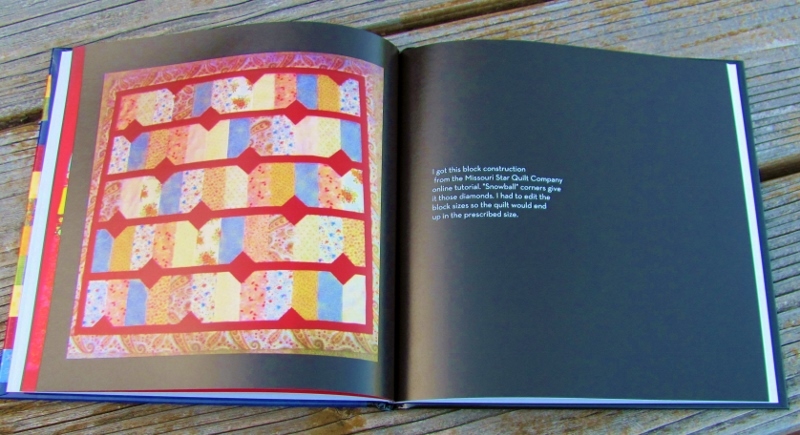 I also included the quilts that are on the front and back covers so I could say more about them. 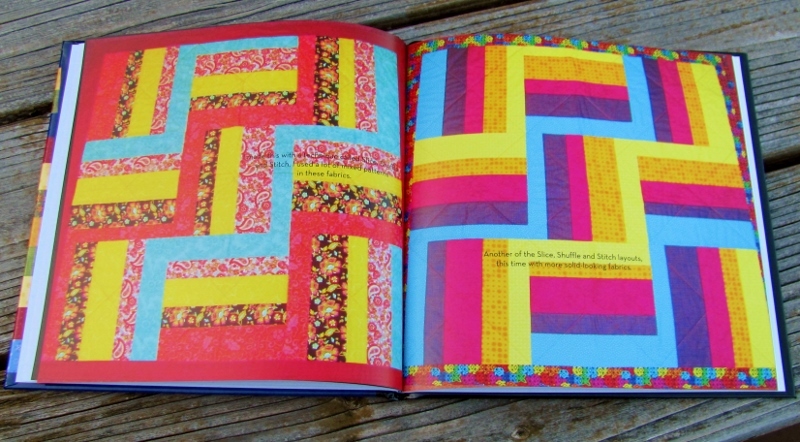 By combining like quilts throughout, I ended up with an extra page at the end. I used it to summarize the project. The back cover has room for a small photo and text. 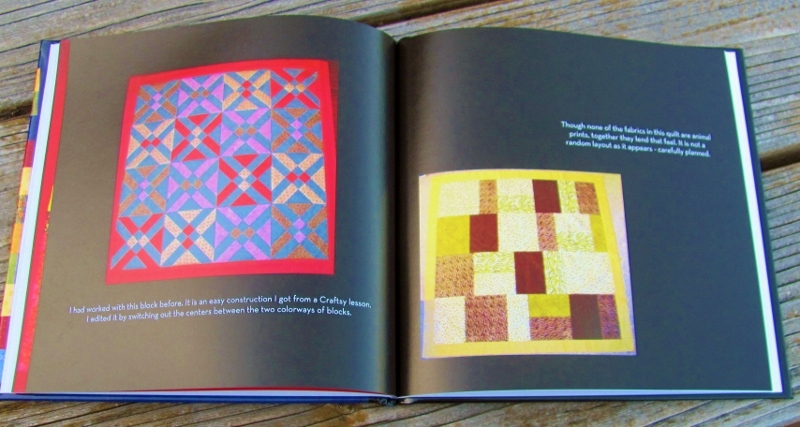 I included the photo of the small grid quilt and added author and imprint notations. I love that it has the barcode on the back cover though I've never scanned it to see what it links to. I had one more coupon for a free book which I have submitted but not yet received back in the mail. Soon, I promise. 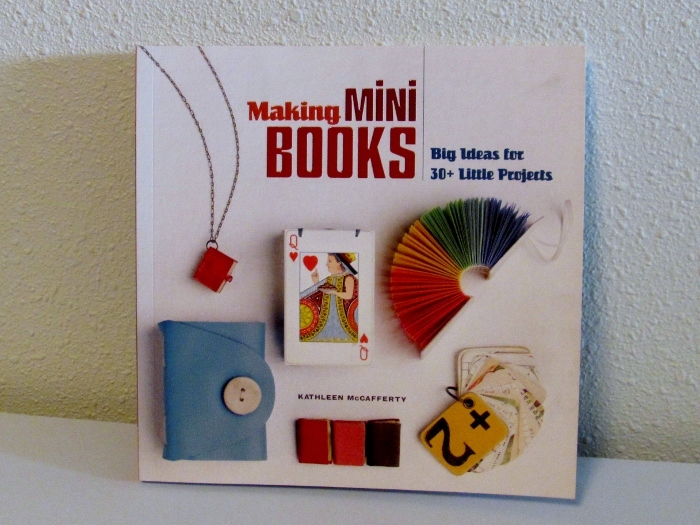 LOVE the tiny necklace book, leather covers, a book of cards, and SO much more. Hmmm, I need to go make books now. When I was looking in the drawer for my metal foil tape for yesterday's projects I ran across a bunch of kits I had made up for a workshop. 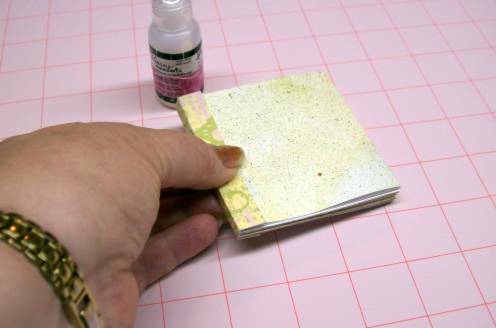 They were to make 1 1/2 x 2 inch sticky note pads into tiny books. I pulled out a couple of them and threw them together to put in my box of "quick things to give to someone". 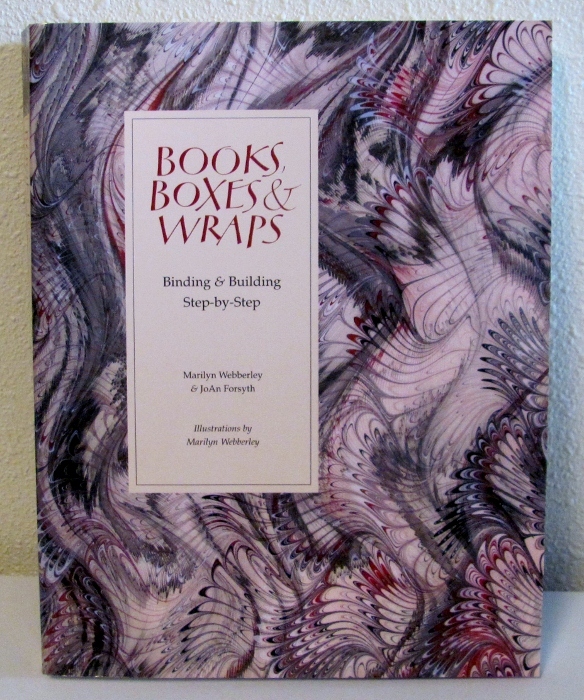 They use thin chipboard for the front and back covers and the spine, pieces of giftwrap to wrap the covers, colored paper tape for the spine, and a lining of a different gift wrap. This picture shows them pretty close to life sized. 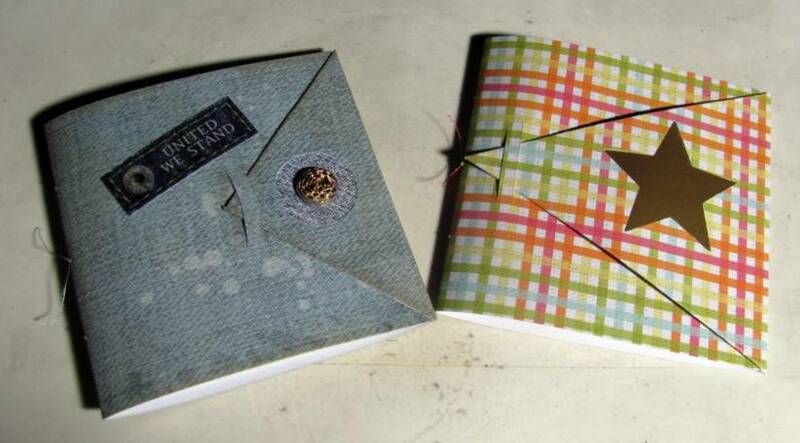 I have instructions on making these over on my website. 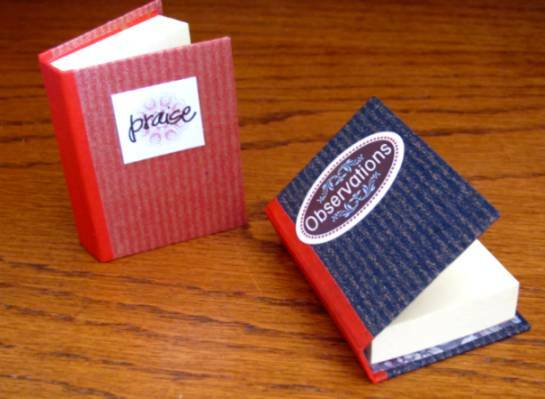 For a ladies' retreat coming up I needed to make 60 little books for the ladies to take notes during the sessions. 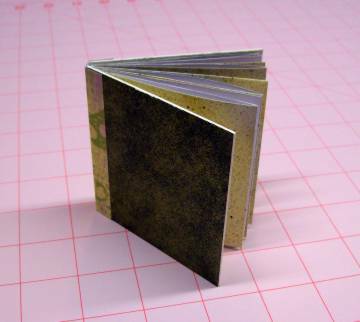 I've made these books before but they always used a cutout/insert of a triangle. We wanted a star on the cover because of our theme so I was going to use my new star punch (this is actually why I bought it). I made a couple of models using different materials so I could see how the star would fit. It did NOT fit on the one made of denim print paper so I finished it up with a plain circle punch and glued a gold button in place. 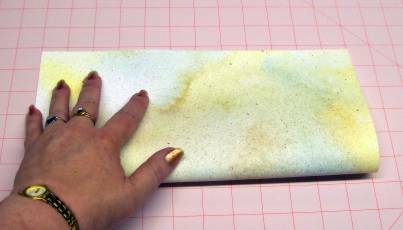 Then I did the front fold taller on the next sample so there would be room for the star and changed up the way the inside of the cover is finished to make it cleaner. When I got the logistics sorted out I wrote out the steps and set up an assembly line for myself and completed the 60 books for the retreat. 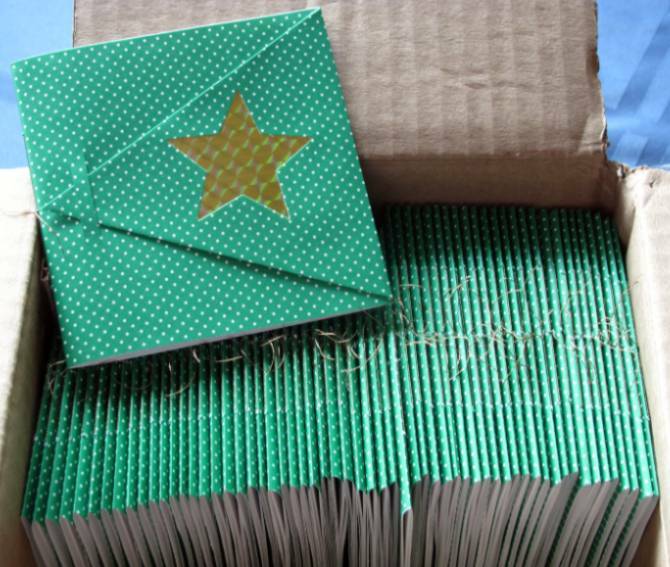 I cut up two large gold holographic bags from the dollar store for the inserts behind the star punch outs. 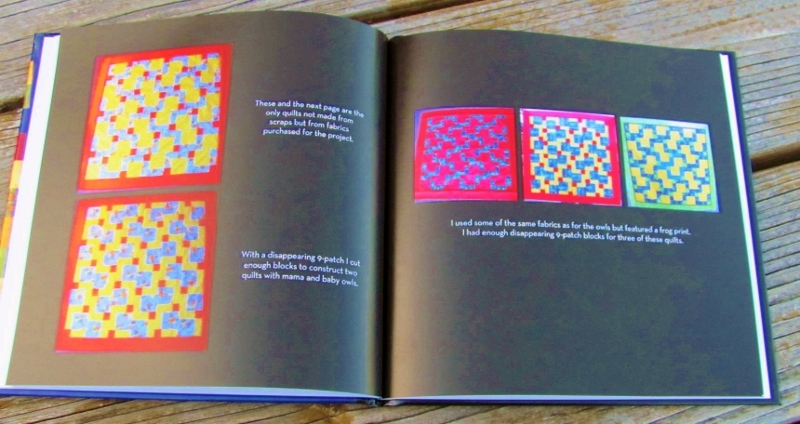 Each book has 6 sheets of paper which, when folded and stitched into the center, gives 24 writing surfaces. 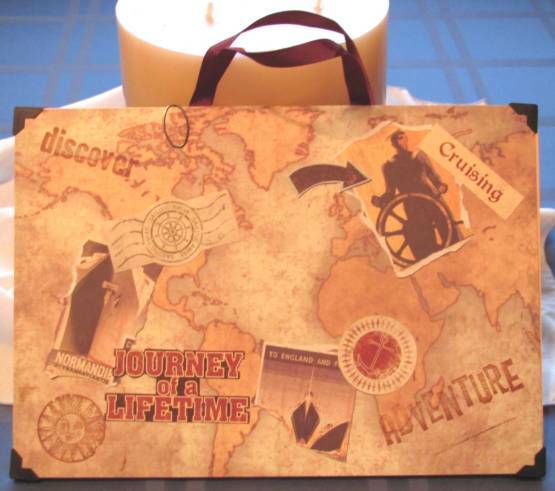 One of the cruiseline's craft projects offered is to decorate a blank journal. 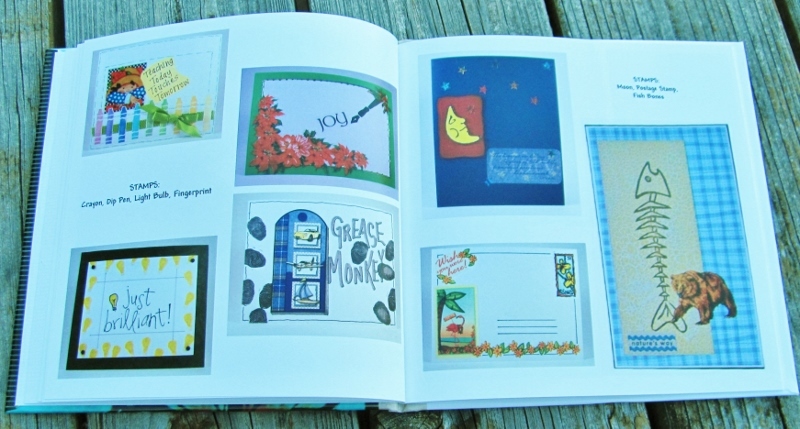 You get the journal, three sheets of cardstock, stickers, tags, ribbon, photo corners, and the use of a few rubber stamps. 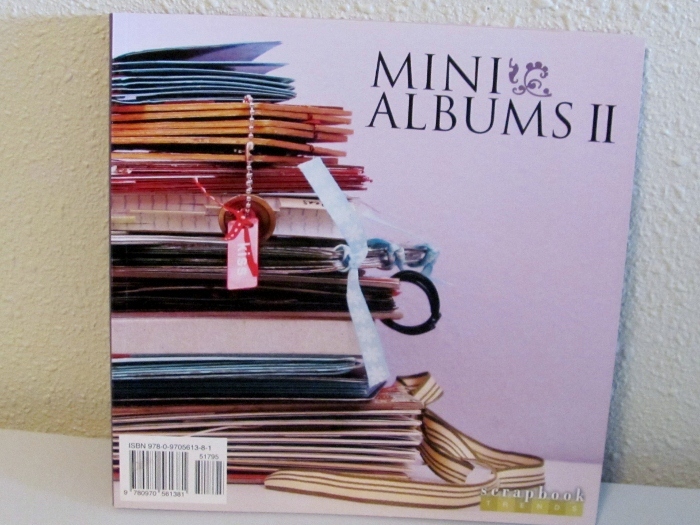 I chose to be unconventional and used the photo corners on the cardstock and mounted it to the covers of the journal. 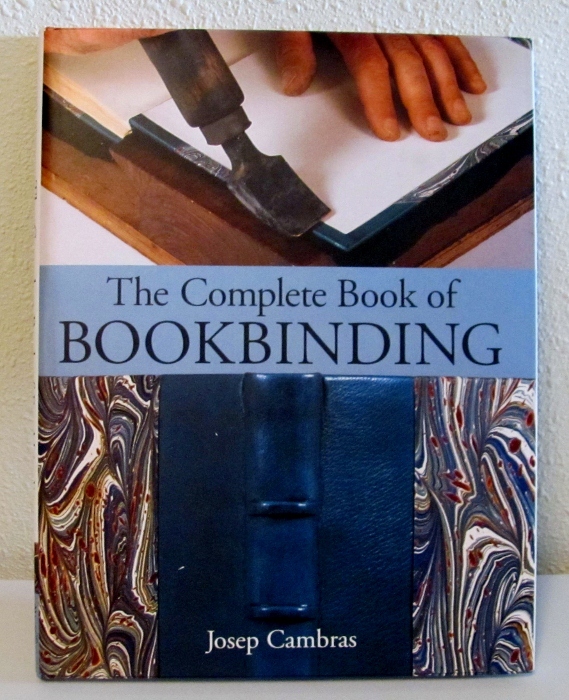 Then I attached ribbon 'handles' to the unbound edge on both front and back. 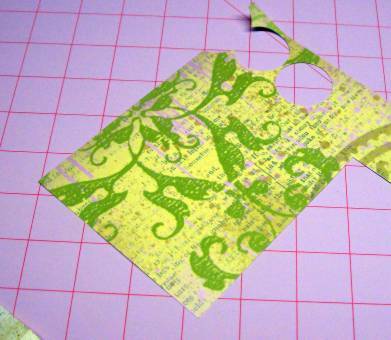 I tore out sections of the third piece of cardstock to use as travel labels, and attached tags to the handles. The result was a 'suitcase' style journal. I applied stickers and stamps to both sides for a bit more decoration, and a few of their paper-clips at the top edge. 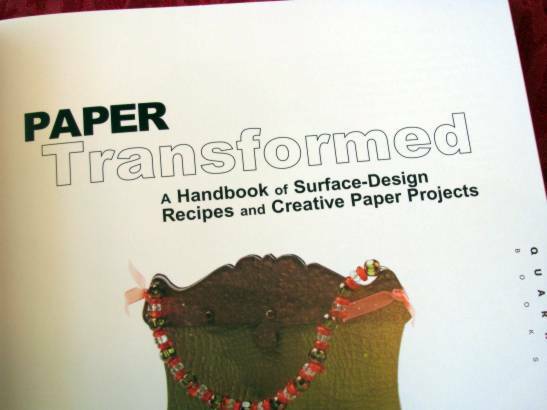 Paper Transformed: A Handbook of Surface-Design Recipes and Creative Paper Projects by Julia Andrus, published by Quarry Books, 2007 (ISBN 1-59253-370-1). 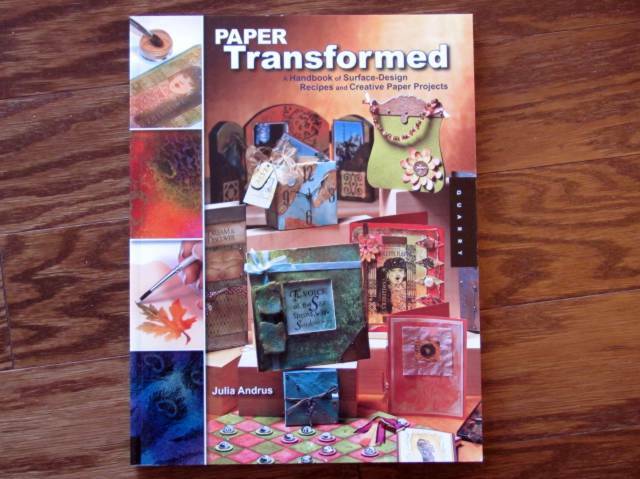 If you have any desire to take your papercrafts beyond cutting up and gluing together commercial designer papers, then this book is for you. Been doing a lot of challenges lately. 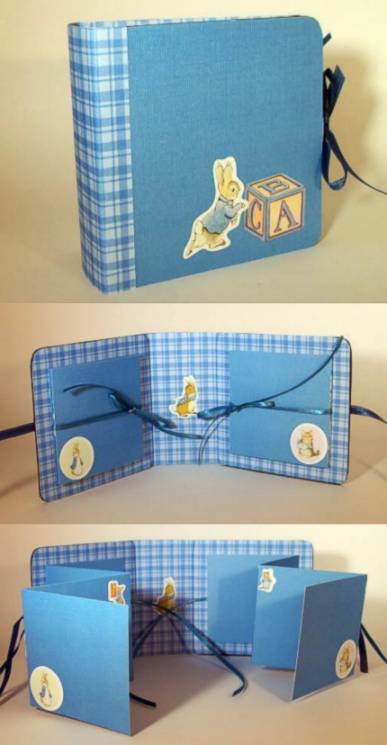 This is the latest, a 'pull out album'. I made mine into a brag book for a friend who is a new gramma. She'll show off those baby pictures with pride in this little album. It holds up to 14 photos. I decorated it with Beatrix Potter stickers. I recently discovered a couple of new series and thought I'd share in case you hadn't found them yourself! First is by Rebeca Seitz. 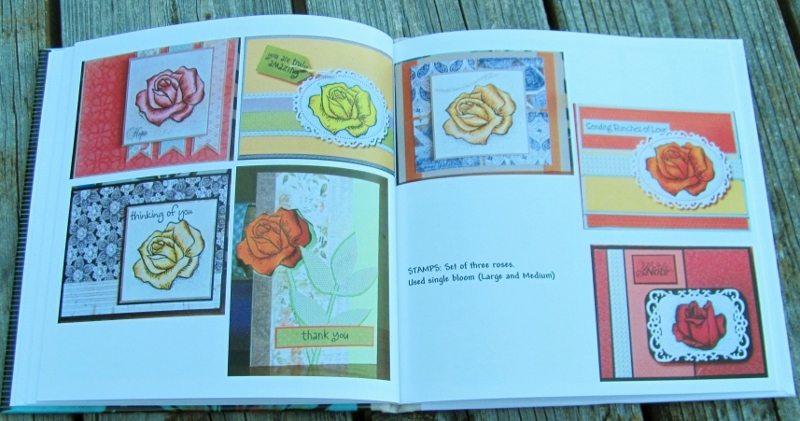 She writes Christian fiction about scrapbooking. First up is 'Prints Charming' then comes 'Sisters Ink' and then 'Coming Unglued'. This summer she will release 'Scrapping Plans'. I've dome across the title 'Perfect Piece' but not sure when it will be released or where it fits in the series. 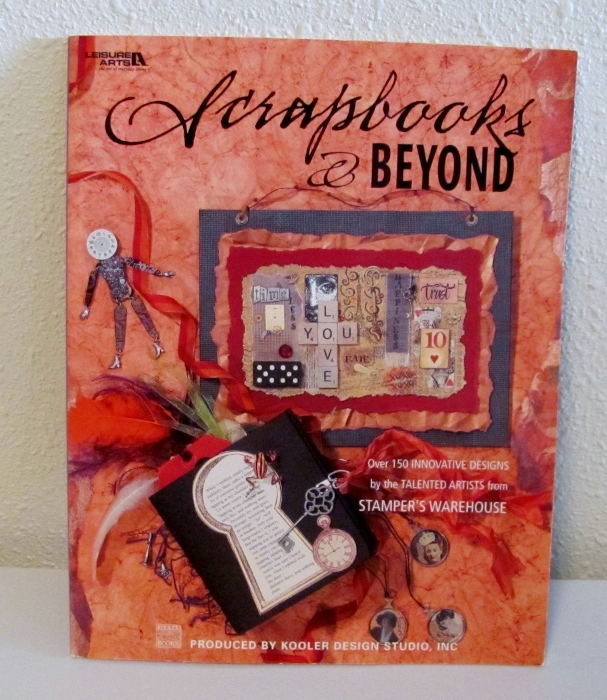 Another author I found is Joanna Campbell Slan who writes scrapbooking mysteries. Her first title is 'Paper, scissors, death' and whe is set to release 'Cut, crop, die this summer. It's fun reading about characters who share your interests and hobbies. 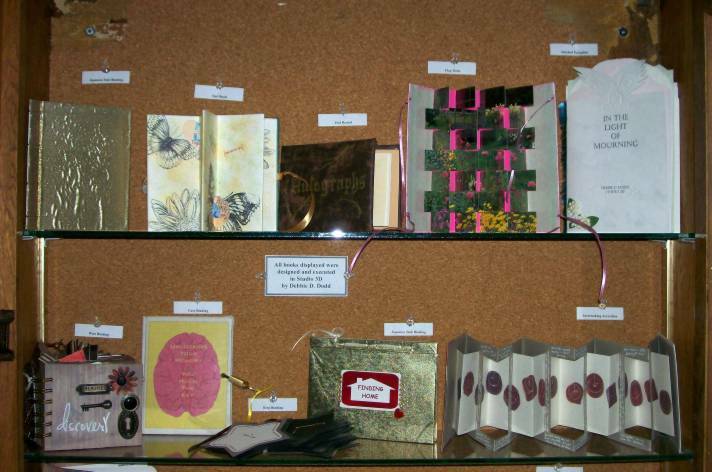 This week I put up a display of some of my handmade books in the case at the library I manage. 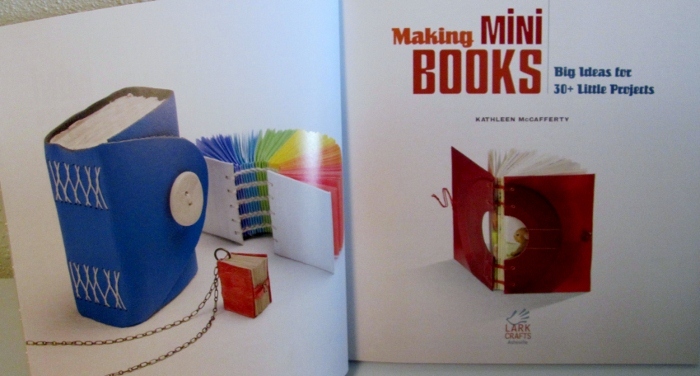 I included our instruction books on the topic on the table below for those who get inspired and want to have a go at it! 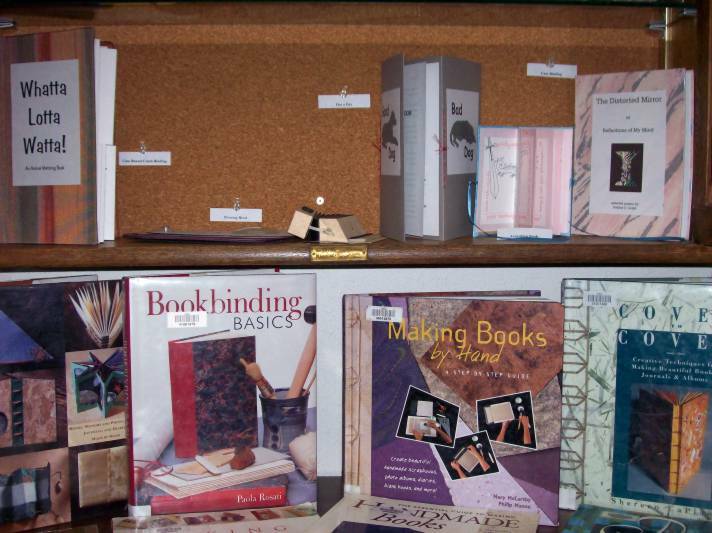 Shelf three: Case Binding Over Comb, Swiveling Rivet, Accordion Book, Dos a Dos, Accordion, and Case Binding. 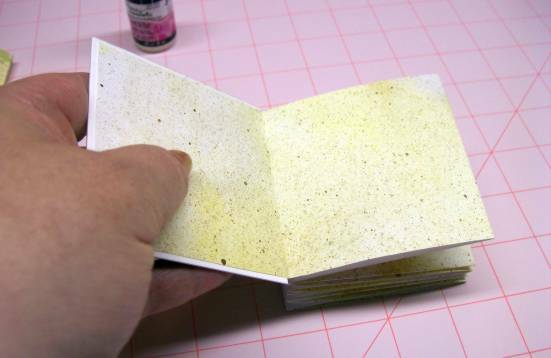 Today there are instructions on how to make a 3x3 meander book SO EASY that I taught it to 5 grandkids this summer - ages 9 down to 3. If they can do it, you can do it! There are two ways of making it. With the boys I made hard-cover books and the girls made soft-covers. Let's begin with the hardcover version. Staft with a 12x12 piece of scrapbook paper. 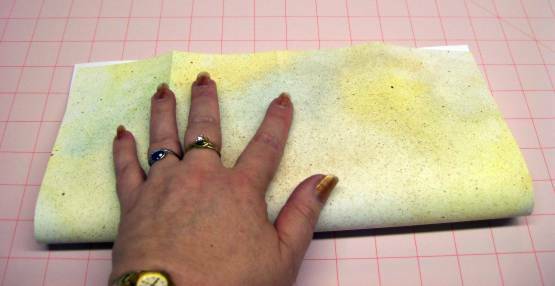 Begin with the printed side down and fold precisely in half. 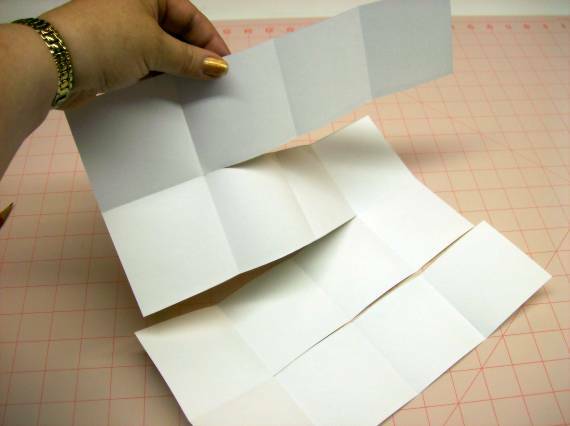 Open and fold the side closest to you to the center fold. 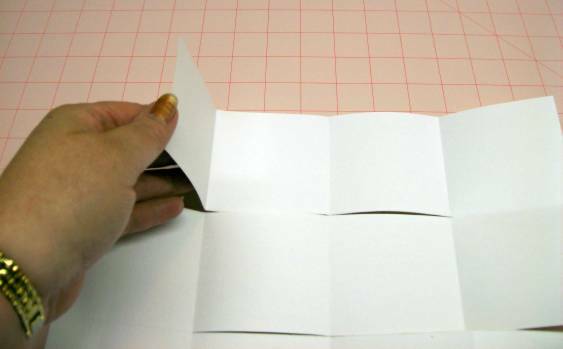 Rotate on the table and fold the other side to the center. Open flat. 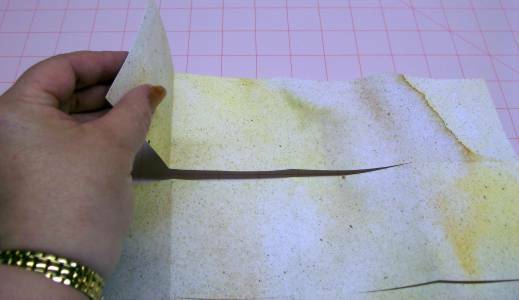 Rotate 1/4 turn and fold in half again. Open and fold side closest to you to the center. 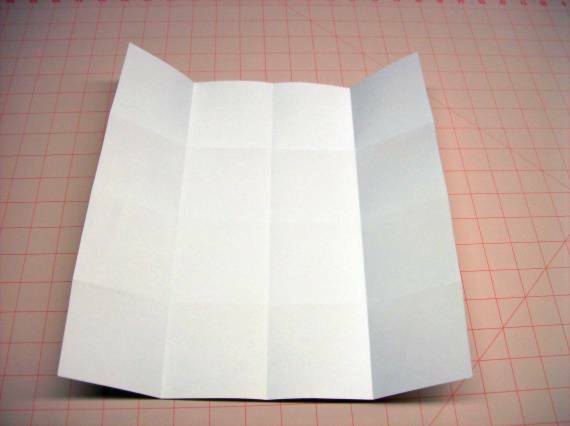 Rotate and fold remaining side into the center. Lay on surface with printed side up. 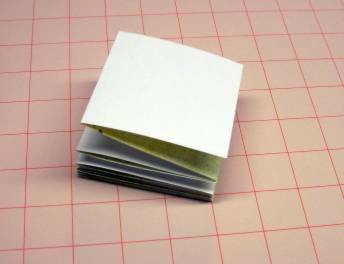 Fold first block (upper left) over. 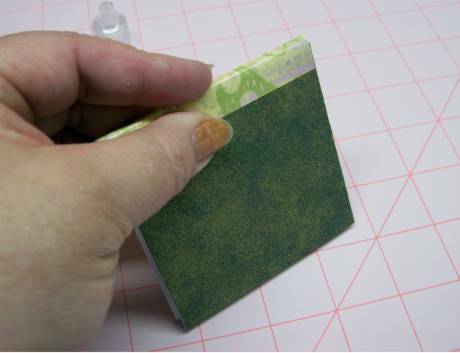 Continue accordion folding around corners right to the end. You end with the book stacked like this. 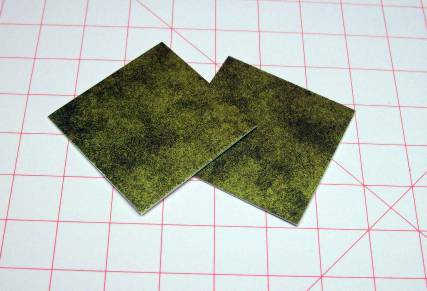 Now cut a couple of pieces of mat board measuring 3 1/4 x 3 1/8. 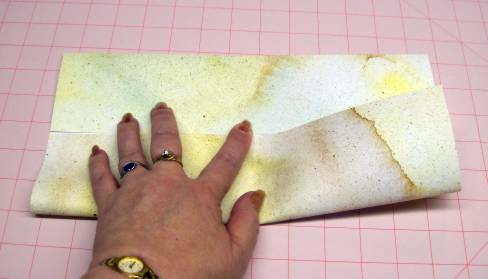 Fold this piece with two creases 1/4 apart running lengthwise. 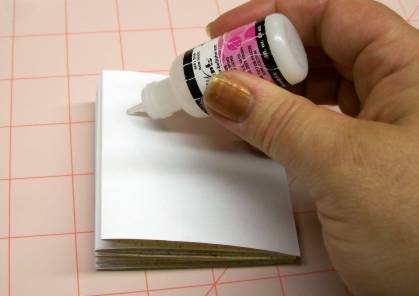 Apply glue lightly to end paper of the book stack. 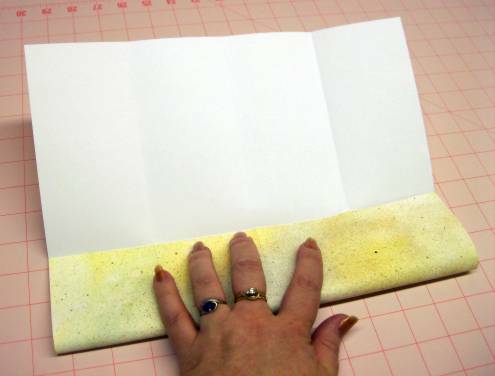 Glue cover board to pages with back of spine flush on all parts. 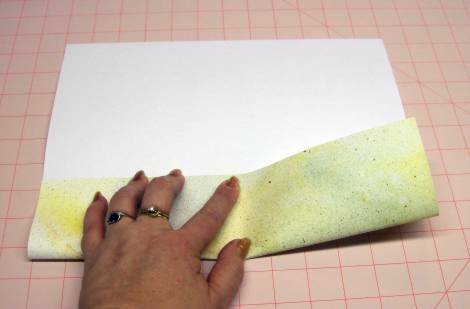 Apply glue lightly to spine paper and apply to book. Now, to make it a soft-cover book, skip cutting out the mat boards. 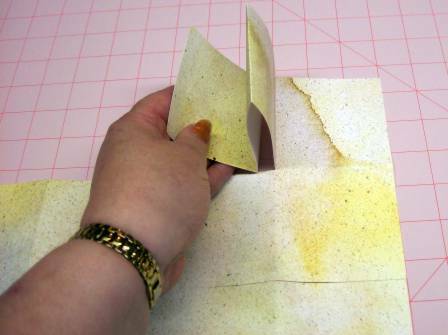 Then when you begin folding, start with the unprinted side up. 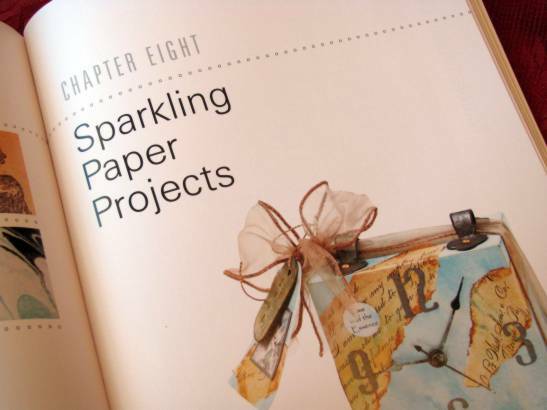 Your stack will end up with printed pages on the outside. 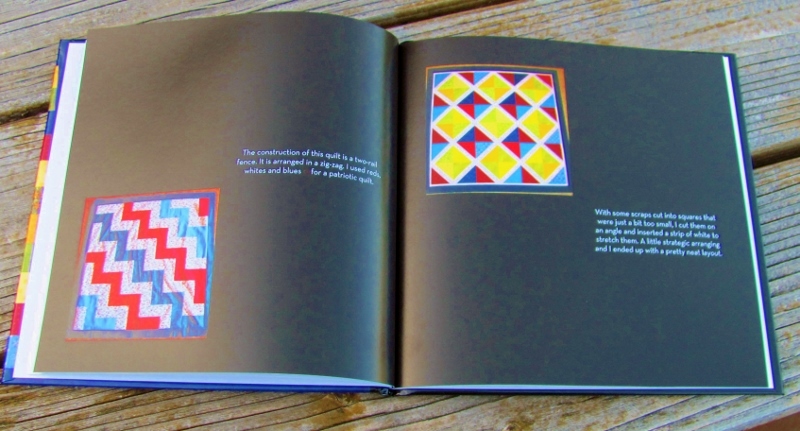 Find the spine by turning the book so when you open the accordion you see color rather then white. 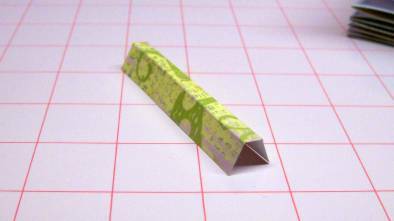 Apply the spine paper (prepared the same way as for the hardback except it will only be cut 3 inches high instead of 3 1/4) to the spine. My family filled my stocking with wonderful resources for a new year of art. 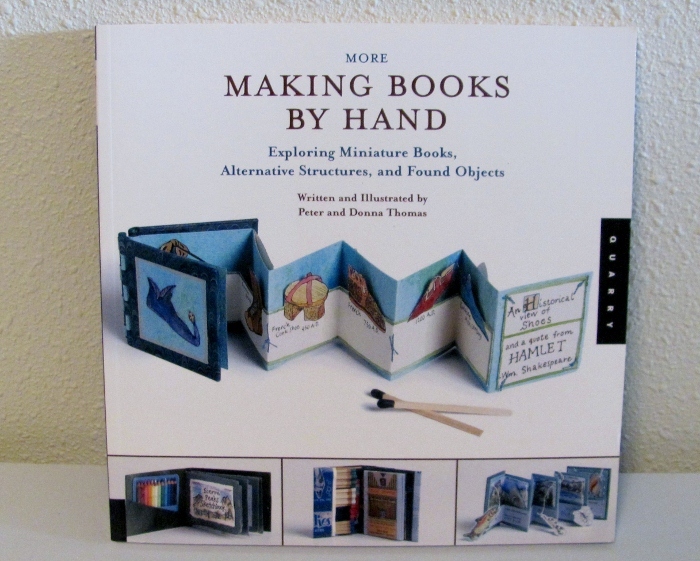 This book has the basics of making books in the first half and 12 book projects in the second. 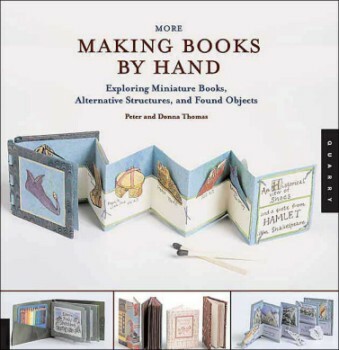 What a great resource for making artist books. 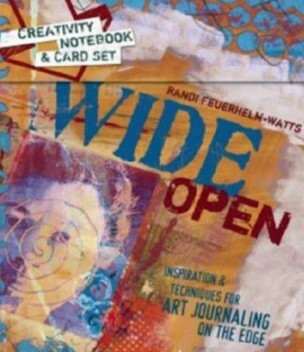 This box contains an art journal with already created backgrounds. 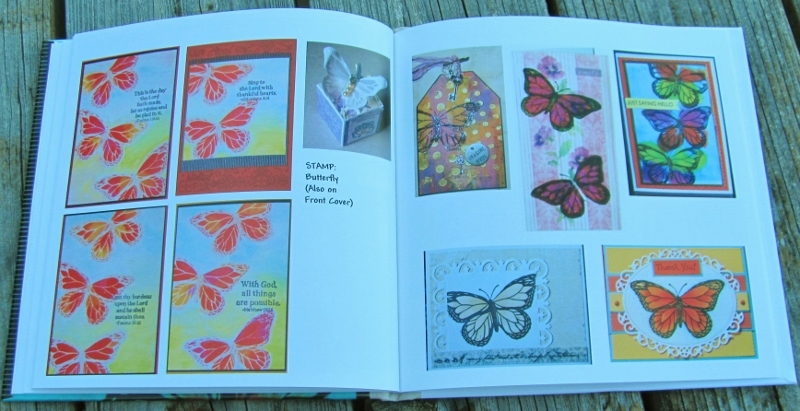 There is a set of cards with creativitiy ideas for art journalizing. 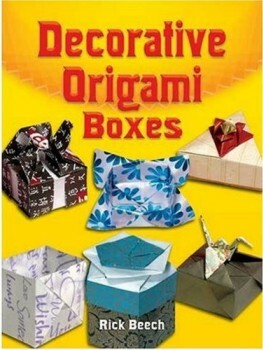 WOW, 650 paper craft projects!. That's more than enough for a year of crafting. 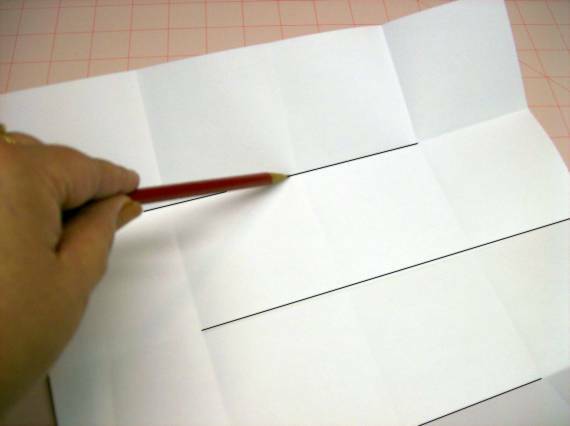 Instructions for fifteen origami boxes (I only know how to make one of these now). 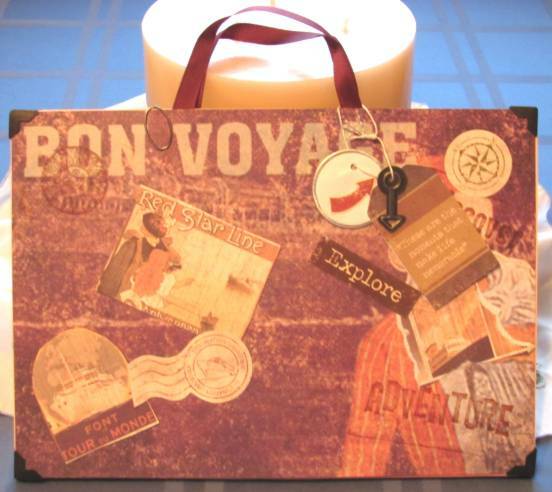 A Monopoly game for the scrapbooker. You design your own board with family photos! 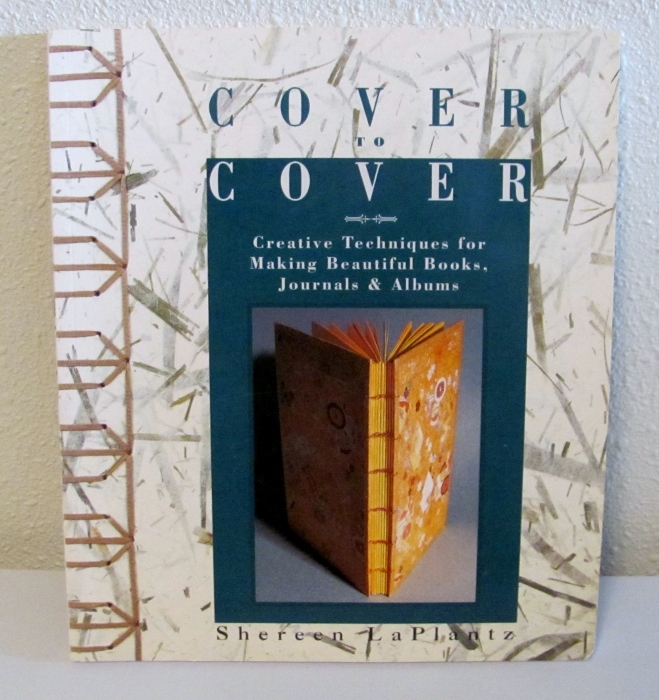 I recently picked up two books on polymer clay, both of which teach faux techniques. 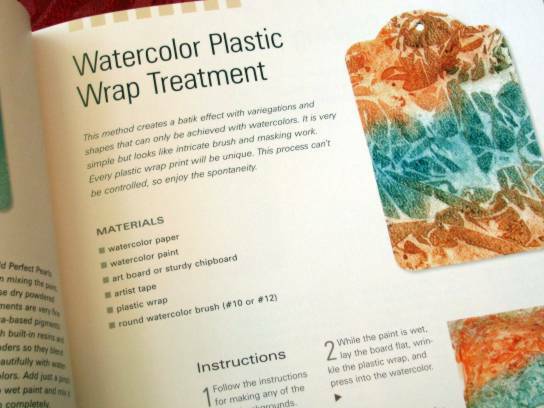 The Art of Polymer Clay Creative Surface Effects (Watson-Guptill, 2007, ISBN 0823103626) by Donna Kato uses transfers, stamps, stencils, ink, paint, and more to treat the surface of polymer clay projects. In doing so she manages to mimic other mediums such as carved wood, metals, and fabulous stones. 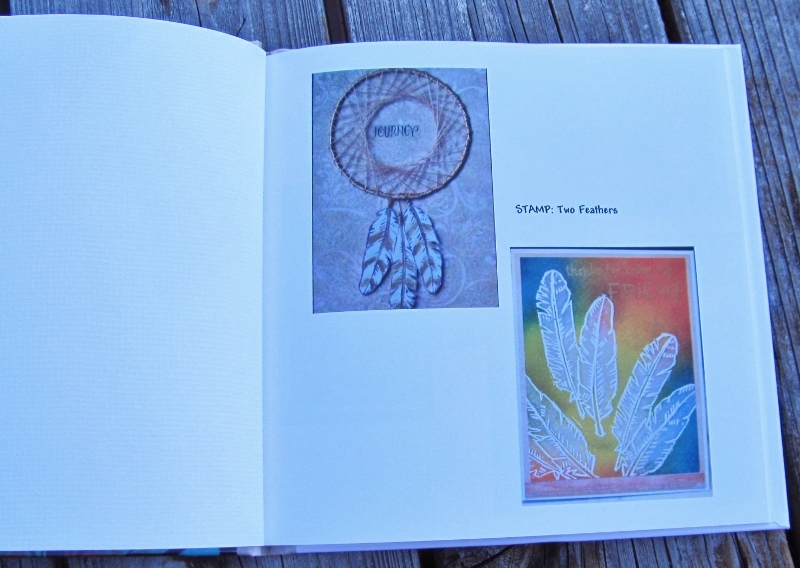 Irene Dean' Faux Surfaces in Polymer Clay (Lark, 2005, ISBN 1579907512) creates the look of marble, scrimshaw, mother of pearl, malachite, leather, cork, pewter, and many precious stones. These two books teach totally different styles but the results of either will be stunning. 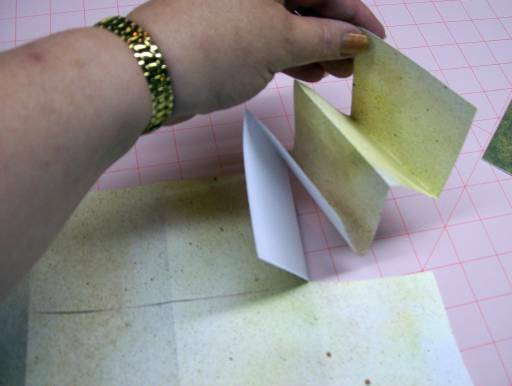 Today I would like to review for you a book on making rubber stamped cards. 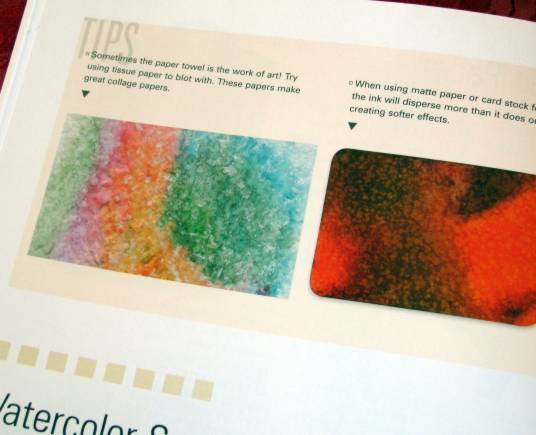 This 2006 publication by North Light Books uses 52 different stamps - all of which could be easily substituted by those in your own collection. 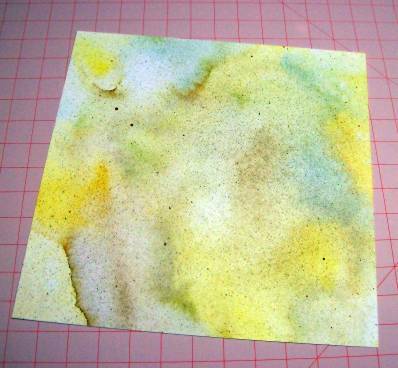 The stamp styles are generally line drawings by Hero Arts stamp company. 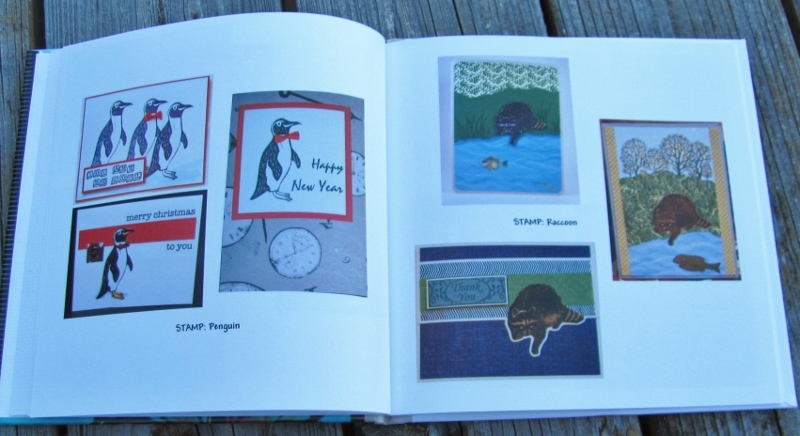 Simply Cards by Sally Traidman (ISBN 1581806744) presents two projects for each of the stamps, each resulting in completely different styled cards. 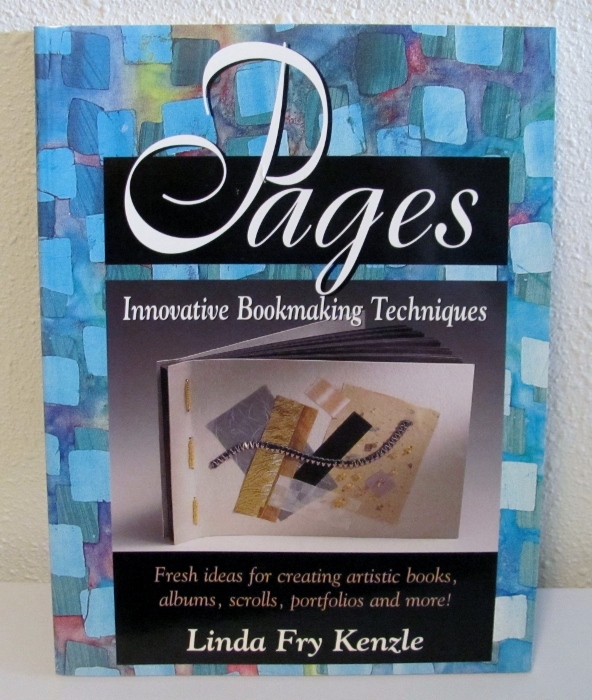 I found not a single bad idea in this 128 page volume. 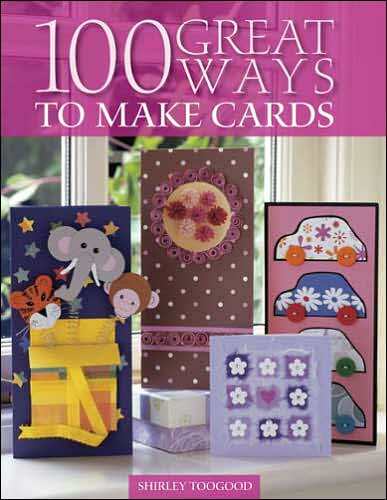 Another new book that is a useful resource for card-makers is Shirley Toogood's "100 Great Ways to Make Cards" (ISBN 0-7153-2308-3) May 2007. 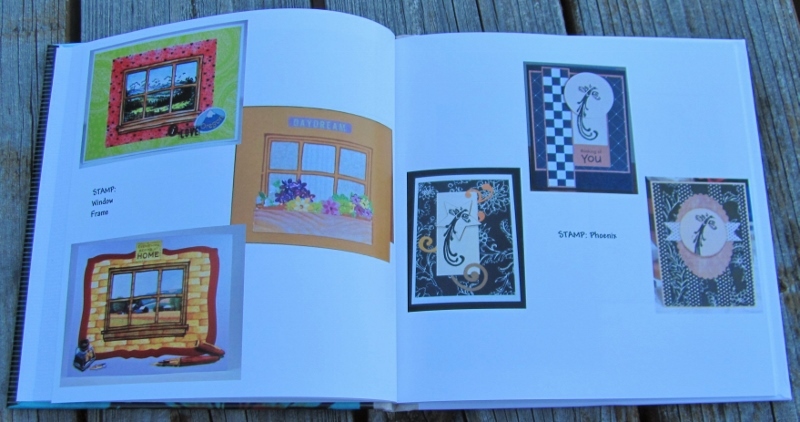 Many cardmaking styles are covered in this 25 chapter book, with 4 designs using each technique. 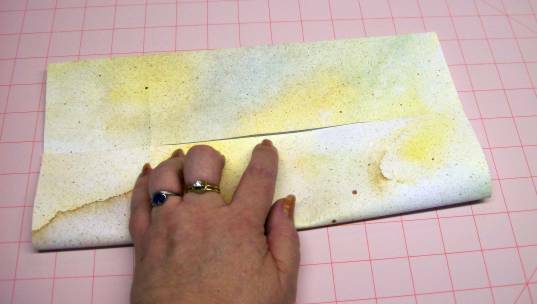 From Parchment to Punches, Stenciling to Stickers, Tags to Teabag folding, Collage to Confetti. 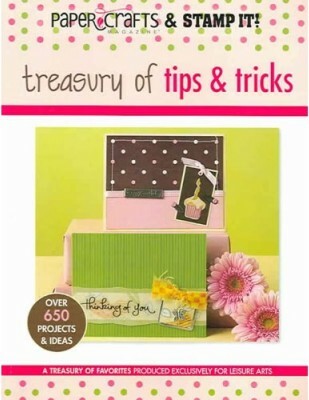 100 card-making tips are scattered throughout the book as well. The table of contents lists several generic topics followed by sports, indoor leisure, outdoor leisure, and special celebrations (milestones and holidays). Indexing is presented in two separate lists: topics and techniques. 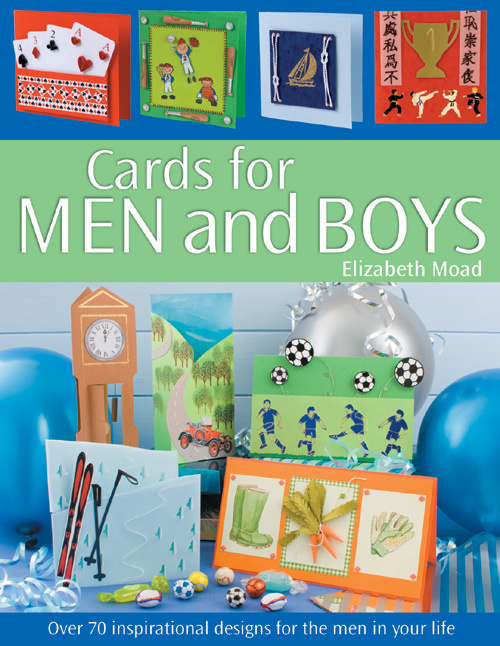 This way you can select your man's hobby and look for a card idea or look for instructions on a technique you want to try and be assured that the card presented will be man-suitable. 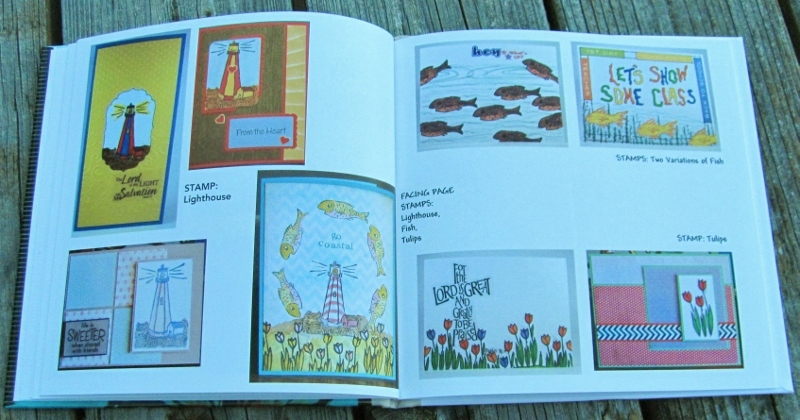 The book contains over 70 ideas including several templates. Even if you never duplicate any card exactly, you will have plenty of inspiration from which to make your own unique creation.